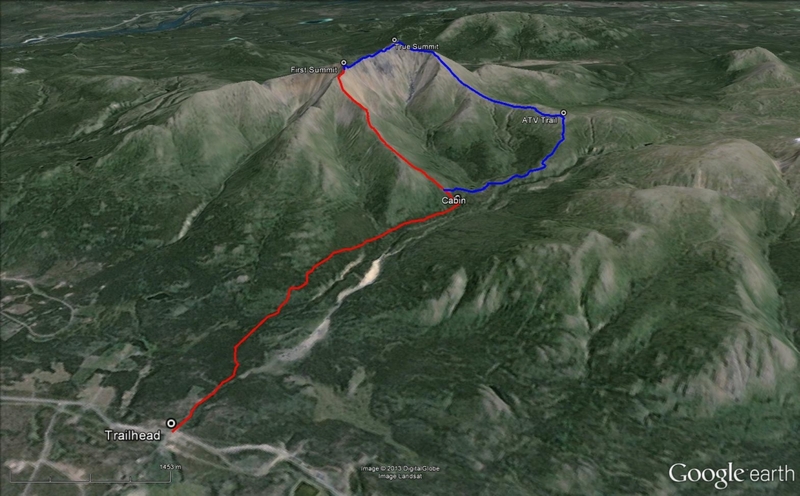 From Whitehorse, drive south to the Carcross Cutoff and turn right onto the South Klondike Highway. Drive south for about 18 km. Two kilometers after the Annie Lake Road turnoff (on the right) will be Bear Creek. There is a parking spot immediately after Bear Creek on the left and right side of the highway. The trailhead is on the north side of the highway (left side of Bear Creek, looking upstream). The trail starts by following Bear Creek for 50 m and then tucks into the trees. Very soon there is a 'T' junction in the path - turn right, as left leads to a house. The trail will follow beside Bear Creek for about 1 km and then it turns off into the trees. 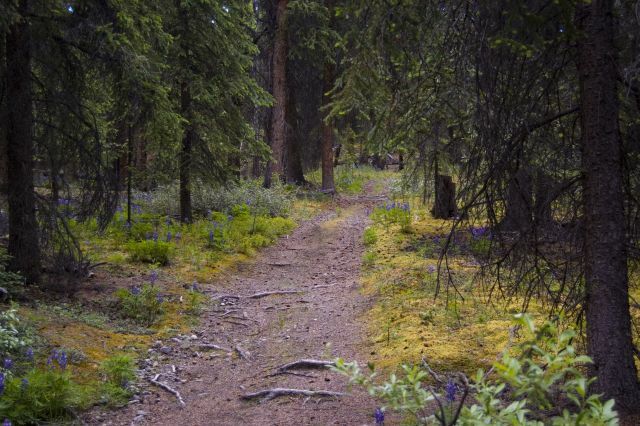 The path wanders through dark spruce trees, and is lined with soft yellow-green moss and wildflowers. 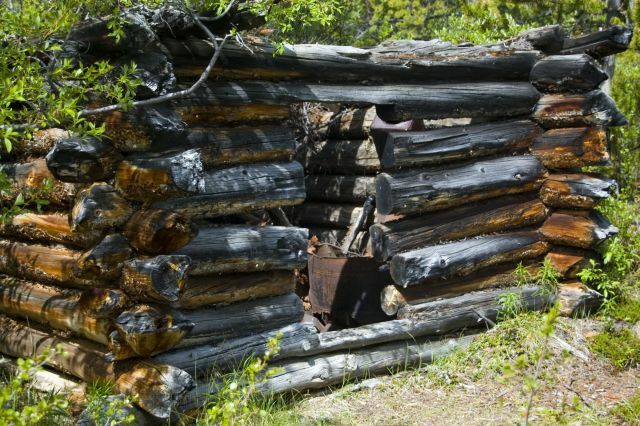 After 5.5 km from the trailhead, you will reach an old trapper's cabin. 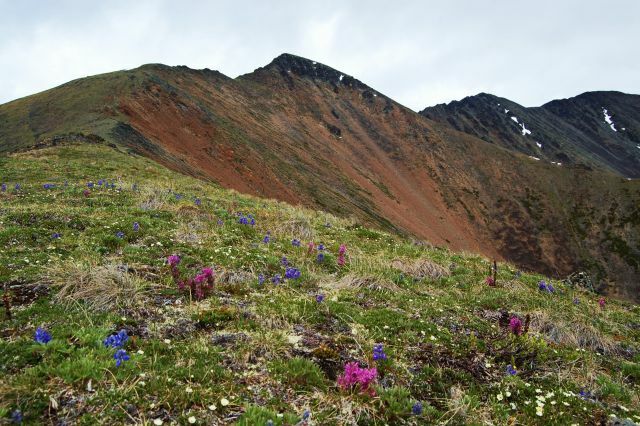 Up until here, the trail has a relatively moderate elevation gain and is wide and easy to follow. Once a the cabin, stop for a view of the valley below. 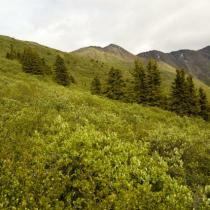 Then, leave the wide main trail and look for a narrow path behind the cabin in the trees which climbs steeply upwards. 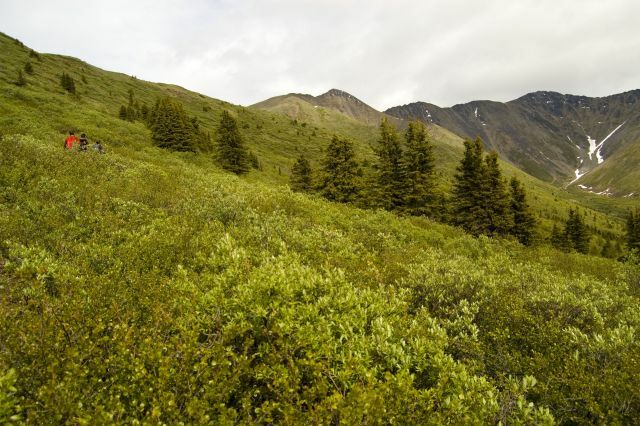 You will soon leave the trees with the trail running through waist high birch and willow shrubs. The trail will eventually get you up to the top of the ridge where the brush thins out. The top of the treeless ridge is a nice viewpoint. 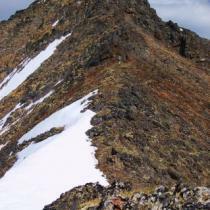 Follow this ridge right up to the first summit which is identifiable by its black, rocky surface. 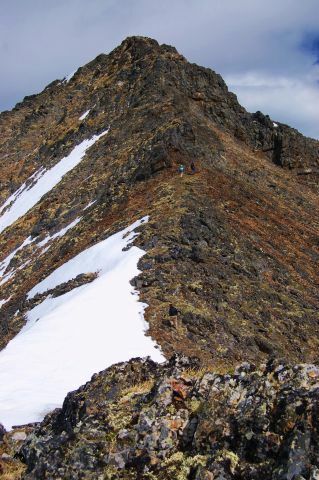 The first summit is steep and requires some scrambling. The easiest route to the top is around the left side of the peak. 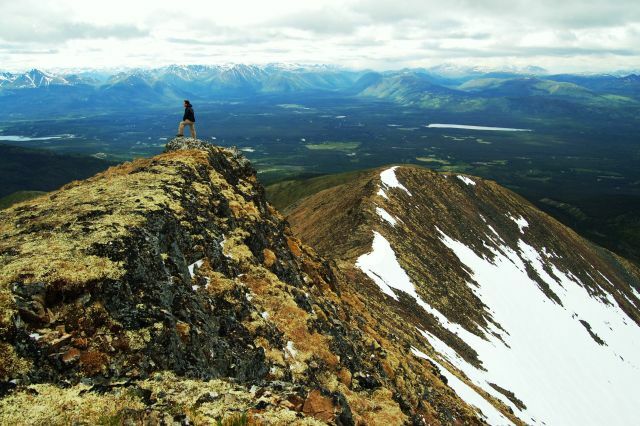 Soak in the views of Whitehorse and Grey Mountain to the north. Marsh Lake is to the east. To the west is McConnell Lake and many snowy peaks. To the south is Bennett Lake. Follow the same route back to the trailhead unless you are attempting the full loop option (below). Expect 9 hours and 23.5 kms total return trip. 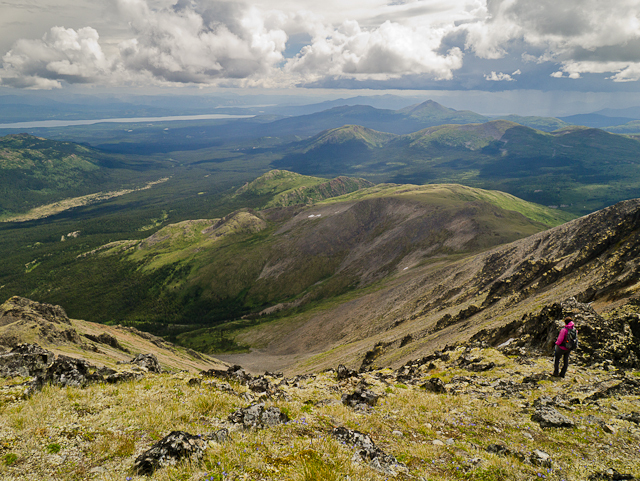 For more views and an exciting and challenging ridge walk, you can hike along the ridge of Mount Lorne all the way to the other side and do a loop back to the cabin. This ridge walk route continues up and all the way along the rocky ridge and then descends onto an ATV trail that will eventually loop back onto the main trail. Expect a total of 9 hours to do this loop. To start the ridge loop, descend from the first summit (described above) along the ridge. You can't get lost, as you will have to follow the ridge all the way around. 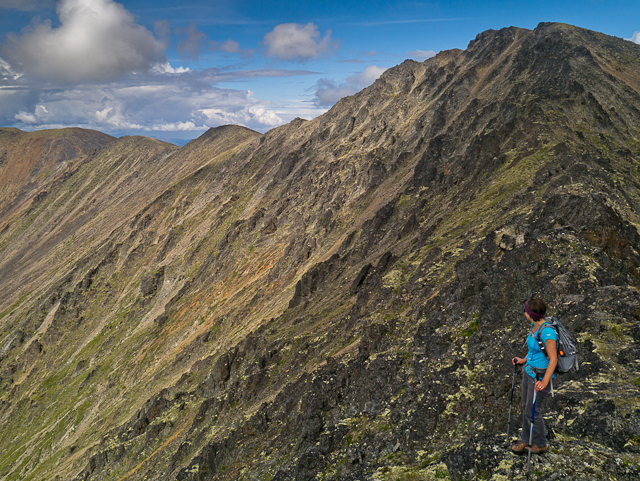 The ridge is narrow and makes for a challenging hike. It may feel a bit exposed in some parts requiring scrambling and skirting around rockier sections. At the end of the ridge, descend down the broad shoulder. 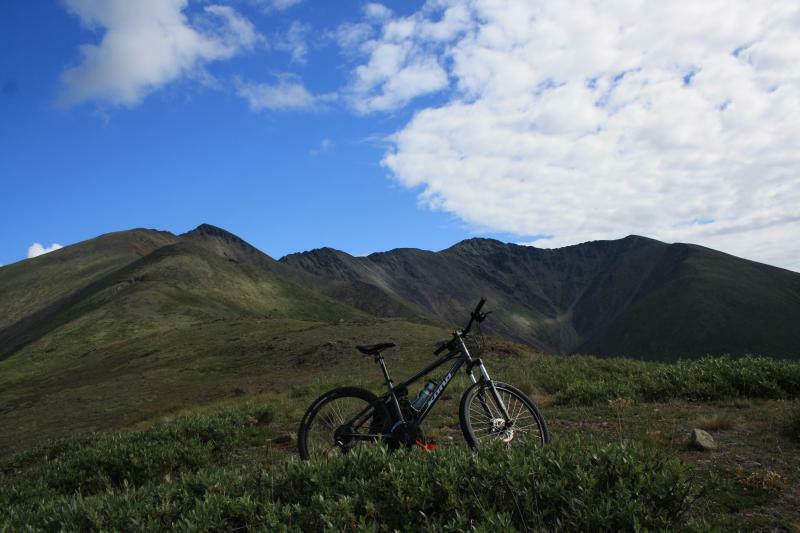 The key now is to find the ATV trail that leads back to the cabin and the main trail. You should aim for the broad ridge angling slightly towards the left. Even though this seems like the wrong direction, do not be tempted to take any of the right branches or descend into the valley - otherwise you will have lots of bushwhacking to do. Once you reach the ATV trail, follow it until it connects back with the main trail at the cabin. Have you been to Mount Lorne lately? Hiked this solo on September 7th. I ran the first 3ish kms on the atv trail, following the blue and orange tape in the trees. It should be noted that at around the 3k mark, the road comes to a t-intersection, with the tape following to the left. Do not take this trail. Continue straight towards the cabin. My phone registered 6.2km to the cabin, not the 5-5.5 suggested here? The trail behind the cabin was easy to follow and well defined. Once you reach the open alpine, you will come out on top at an inukshuk-use this to find the correct trail when coming back down. I ran along the summit for quite aways until it started to snow and became really windy. With zero visibility, I turned around only minutes from the true summit as the rocks were too dangerous to climb in the conditions. 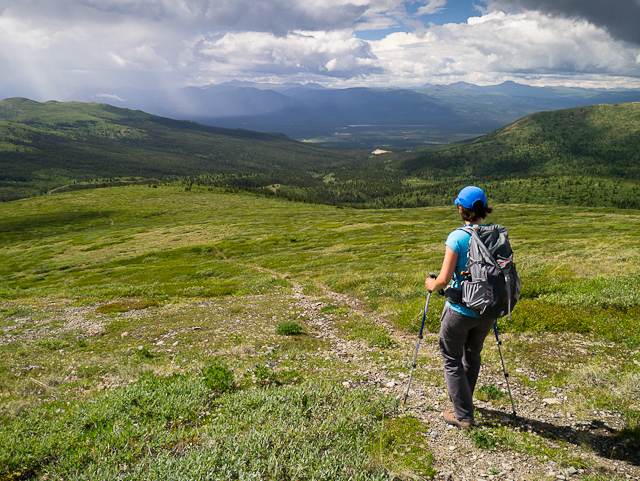 If hiking during fall or spring in particular, make sure you are packed and prepared for these conditions. 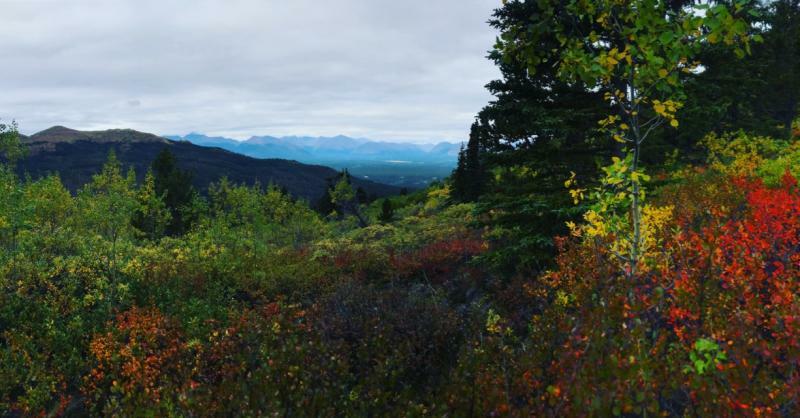 All in all, it was beautiful to see the fall colours, and I throughly enjoyed the hike. I did not cross anyone else on the trail, nor did I find any evidence of bears or other animals. Up and back took 5.5 hrs, with a lot of running and stopping for pics, 22km total. I should have taken a moment to read this page before I left. I went up the ATV trail for only 3 km, never reaching the cabin. Then, I thought that was enough ATV and I bushwhacked to the first ridge located west of the main trail (first human to do that?). I made my way to the summit anyway. The ridge was fun, not too exposed, but slippery when wet. Hiked to the first summit yesterday. Light breeze and cloudless sky, but very cold. Trail was pretty easy to follow past the cabin despite lack of tracks. Brought snowshoes but left them at cabin as it didn't look like we'd need them. Some stretches of knee-deep snow just above treeline, but snowshoes would've been overkill for the rest of the route. 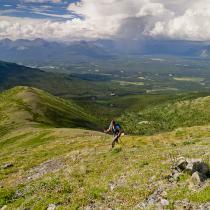 Did the Ridge Loop Option on Sun Aug 19. Very pleasant going to the First Summit...then it got tough. I would take a bit of an exception to describing it as "The ridge is narrow and a pleasant walk, but it is still wide enough to be safe." It was extremely difficult in places, with lots of rock scrambling around steep drop-offs. It wasn't always possible to stay atop the ridge, and we had to drop down (albeit not very far) to skirt impassable boulder sections. Took 11 hours from start to finish. 1. 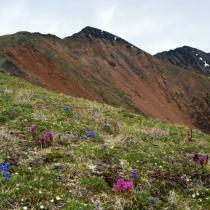 The hike is all on a well-used trail up to the top, so you shouldn't ever be required to bushwhack. 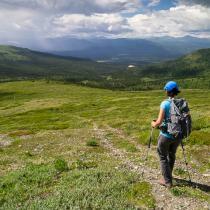 You probably won't get lost if you go off trail but might find it frustrating. 2. It's very worthwhile bringing a bike for the first section. If, like me, you can't push it uphill the full 5.5km to the cabin, you can shave off a couple of flat kms at the beginning and the end. Easy riding. Just finished this trail - great hike, but the description of the loop is a bit misleading. While on the ridge the path is sometimes impossible to find and we had to find our own way, sometimes by scrambling on the edge of the slope. At points it was impossible to stay on the actual ridge line. A great challenge, though, and a good feeling to have "conquered" this one! We hiked it on June 10th (on what was probably the hottest day of the summer!) Very beautiful (but hot!) hike. You're on a shaded trail for the first 5km but once you get past the cabin there's not much coverage. We found the trail head without any issues. We didn't have any issues following the path to the summit. Just remember to go behind the cabin to continue with the hike, rather than continuing on the original trail. I had my small (energetic) dog with me and she didn't have any issues but probably wouldn't have taken her if we were doing the ridge loop. We didn't quite make it to the summit and it took us 7hrs round trip with plenty of rests and hydration. Hiked it today, May 12. I got to the top of the black rocky peak (quite a climb right at the end I thought), and couldn't get any further because of snow and me only wearing jogger. It was pretty low visibility and snowing up high and I sort of lost the trail on the way back along the ridge and didn't hit it again until about half way down to the cabin. Then all easy downhill from there. Amazing views and definitely worth the effort though! A very good trail ! Your description is very helpful. I just want to add that there's another T-junction at around 3 kms from the start, just after a little climb. You have to keep right and 2,5 kms later, there's the cabin. Just returned from Mt Lorne loop today. Bear creek is 1.3 km from Annie lake road, park right after the creek on the left, walk back and a really good trail can be found immediately on the North side of the creek. I chose to bike up, there is more than 300m elevation gain from the trailhead to the "cabin" so it's not a ride around the block but definitely worth the effort. I couldn't find the cabin either but started heading up at a rock fire ring (blue surprise box 20m up in the bush) and came upon a good trail within 5 minutes which was followed to above treeline (no real bushwhacking if you follow this trail). Take a good look at the route ahead all the way down to the ridges and spot the ATV trail, this will be the way down. It is the farthest ridge with the lowest treeline. Take note. There is some very short hands on scrambling (3rd class) to the first summit, careful scree walking down from the first summit, and then more short hands on scrambling towards the second summit. I find staying as close to the ridge proper works best as the rock is more solid and there are always options to avoid difficulties on either side. Following the ridge from the second summit down is probably the crux of this route. I again recommend staying on the ridge as much as possible and avoiding difficulties on either side. You shouldn' t lose and regain a buch of elevation trying to stay on route. From the bottom of the technical ridge, spot the ridge you've identified when you got out of treeline and go down and left. Again there are a couple of small knolls that are part of the lower ridge and those can be followed to avoid thicker willows. You'll gain and lose some elevation but will get easier travel and better views. Keep looking for the ATV trail and find you way back to the cabin. If you were keen to bring a bike, you'll be back to your vehicle in no time. Amazing ridge walk, great day in the mountains! 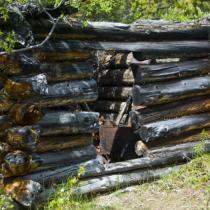 Hiked part of the Mount Lorne Trail today but somehow missed the trapper's cabin. Found the creek with the tin cans in it but not until the way back. Made it to a fairly high elevation but didn't get out of the trees. Anyone know how we missed the cabin??? 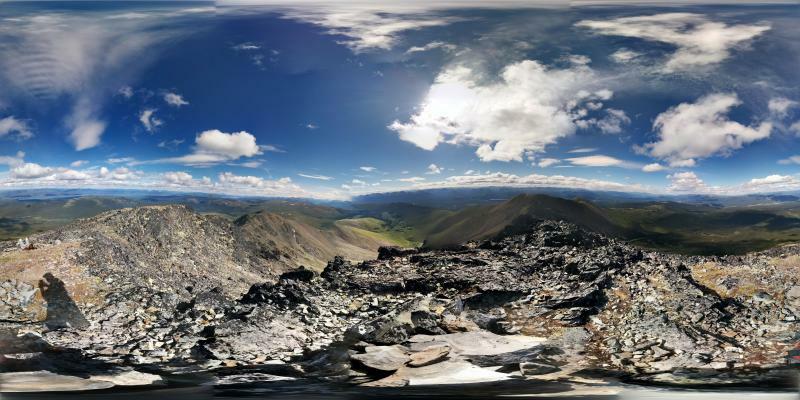 Hiked to the summit and back yesterday - beautiful hike on a great day. Took us about 6.5 hours with several leisurely breaks. Does anyone know the woman who lives near the start of the trail? She was biking with her two Husky x dogs and one of her dogs bit ours. I'd like to get in touch with her, since we're going to the vet today. Note to other hikers - might be wise to keep your dogs leashed near where the trail forks into the private property. Completed the ridge loop yesterday. Completely unsatisfied with the services of the cabin. 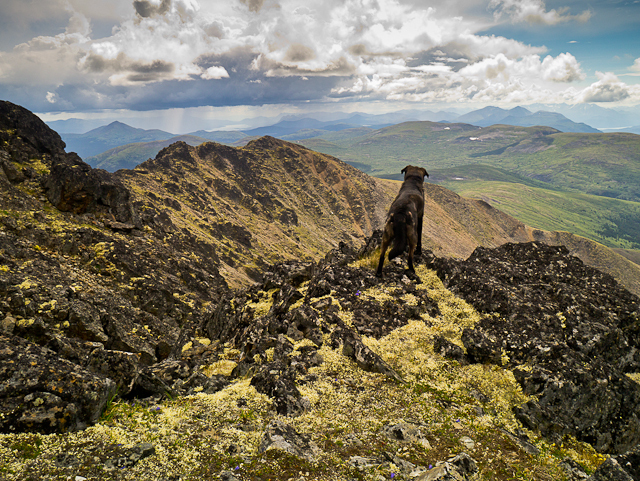 There were only a few tricky spots with rocky embankments along the tallest areas of the ridge, but i'm still happy not to have taken my 11.5 year dog on the trip. We biked to the cabin, and I would definitely recommend. Bombing down after a good day's hike is worth the push to get the things to the base of the mountain; bleeding arms and all. I'm thinking of doing this trip this weekend. Does the cabin at the base serve espresso-based drinks, or only drip coffee? Hiked the summit and back as a day hike on June 14th. Was a beautiful sunny day, great hike with rewarding views for much of the hike. Took us about 5.75 hours with a leisurely lunch at the top. We didn't quite go to the summit though, I imagine that would add on about an hour. I would definitely recommend this hike and can't wait to try the loop next time! Six of us ladies and our dogs hiked the whole ridge loop on Saturday and it was definitely a challenge! Getting past the first summit was quite scary due to the loose rock and scrambling and then the fog rolled in and we ended up following the ridge in the wrong direction. The website says you can't get lost, but that's on a clear day; in fact you're coming off one ridge, descending down and going up another to continue along the proper loop. Once the fog cleared about 30 mins later we realized that we were looking down the wrong valley and had to backtrack. For the second (true) summit, it wasn't clear that you should go around to the left and we felt a little at a loss as to which way to go as - again - it was quite steep there. I see that you've rated this hike 'difficult' and that's great, but the description of a 'pleasant ridge walk' does not convey how hard this hike can be, especially for an intermediate hiker. It is also not clear that 9 hours and 21 kms is for the ridge loop ONLY; we thought that it was for the entire hike from the trail head so we underestimated how much water and food to bring. 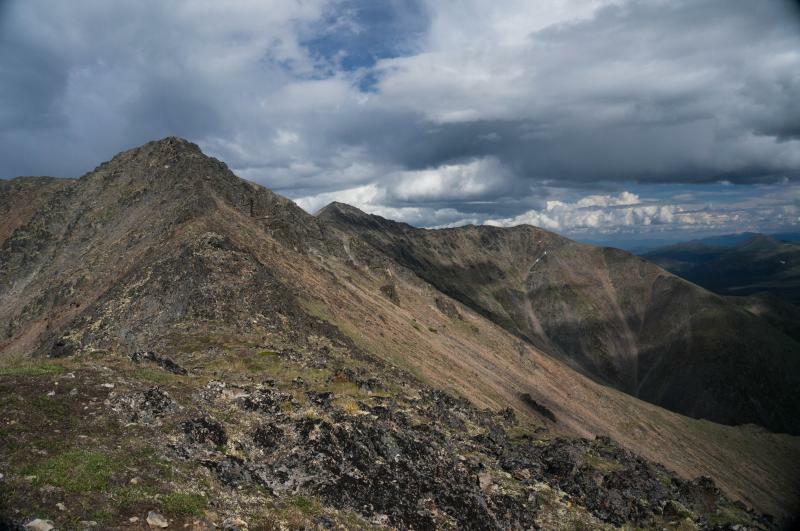 Don't get me wrong - this website is AWESOME and I/we use it often, but perhaps the written description of the ridge should be modified so that people are prepared for the difficulty and length of this hike. We're all quite fit and do a lot of hiking but our success last weekend was largely due to luck (with weather etc) as we were a little unprepared. That being said, we had a great time and the views really are awesome. Beautiful spot! I was up the same day as Travis I believe and met up with them on my way back down. Having left the creek at the road on my bike just after 9am. The weather was overcast but it was a great ride in up to the cabin. At this point the map differs from actual. The ATV trail continues right past the cabin. The hiking trail starts right behind the cabin and does not split off. At this point if you take a bike either leave it here or continue on the ATV trail... dont do as I did and carry your bike to the top. Lesson learned. The hike only gets difficult at the first ridge. Be wary of the steep rock in this area as its split and loose. The left side of the ridge is easier but the moss and growth covers loose stone under them. There isnt much room for error depending on the route. 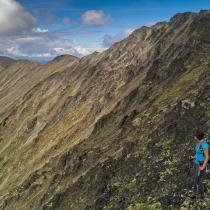 After the first ridge the hike isnt difficult and as said offers great views in all directions. 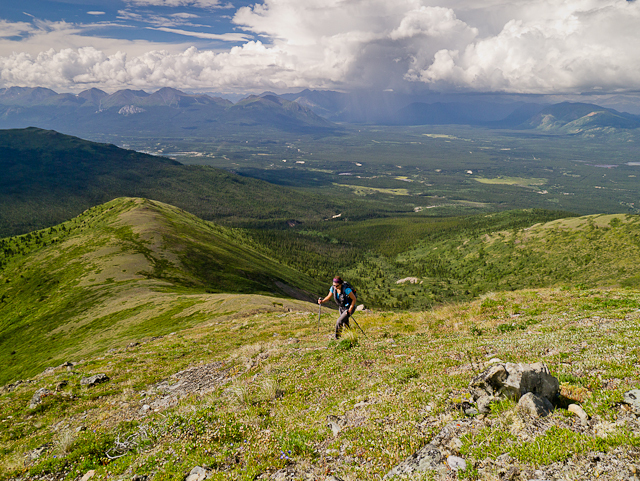 The day up on July 19th had amazing weather of rain pockets and thunder storms toward Marsh Lake, Grey Mountain and Carcross. After the first ridge and continuing on to the second stay left. Coming down toward the second ridge this will lead you to paths down the scree slope in an obvious small red rock path. The main ridge has moss cover and is a great place to sit and enjoy the view and eat lunch. I returned the same way due to having left my bike below. I could only ride maybe 10 - 20% of the trail back to the cabin. The ride from the cabin back to the highway is great and returned back at 5pm. Great day hike close to town. We didn't get started until about 1pm, so we hiked to the first summit and back. Total trip time was 7.5 hrs. The trail is well defined and easy to follow up to the ridge. 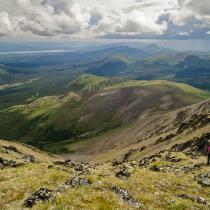 The walk on the ridge offers great views in all directions. 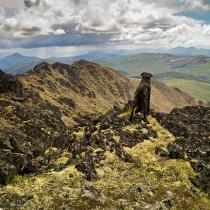 Our dog had no problem with the summit, but she's a bit of a mountain goat. Next time, I'd bring a bike and cycle the ATV road to the cabin. It'd be much quicker than walking and would give you more time to explore. Just finished the loop trail with my wife and dog. Great hike but much longer than we thought. My GPS read 33.5 KM not sure if it is because of us switch backing back and forth on the ascents and descents. 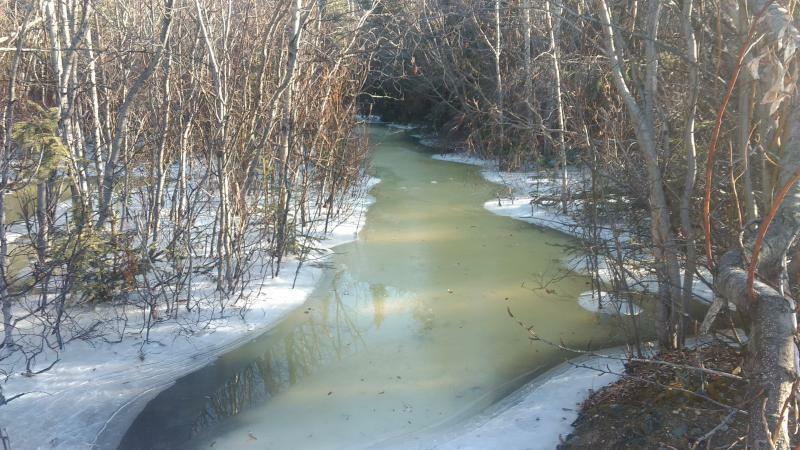 No water is available once you leave the ATV trail (other than odd snow patches). There is a stream about 1-2 KM before the cabin and another one past the cabin along the ATV trail. If your dog is not very agile and and a poor climber, I would probably recommend they stay home, especially if you intend to take the loop back. Luckily there was still snow higher up so he (our dog) was able to cool down and hydrate and stretch his water supply. Is there a water source at the cabin or anywhere past that first 1km mark? When you were on Mt Lorne on May 4 how much snow was there? Height and coverage (ex: walking on snow for half of it? boot/shin/knee height?) would be useful to know. Thanks! awesome weather and a great place to explore. Very inspiring for haikus. The ridge loop is definitely long but worth it. Hi All, I LOST a Black Diamond hiking pole on the main trail of Mount Lorne somewhere between the old cabin and the parking lot. On another note, we also FOUND a Marmot rain jacket on the south ridge of Mount Lorne. Please leave a note here if you have any information on either of these items. Thanks! Awesome hike for the long weekend, it was still a bit of snow but, it was a beautiful day, no bears, it took us like 6 hours we took our time. 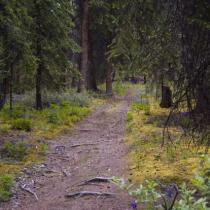 I love the trail that lead to the cabin before the climb. The trail was packed down recently by a snowmobile which made walking easy. We had snowshoes on, but didn't need them for most of the way. A sharp left from the cabin, there was a trail already packed down most of the way to the base of the ridge. Up in the alpine, the area was very windswept and posed no avalanche risk (only a few inches of snow on parts of the ridge). 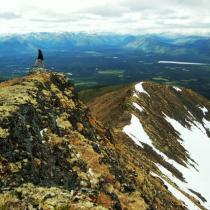 We only made it up to the base of the ridge, but you could continue without any problems along the ridge. We saw caribou and lynx tracks in the forest.